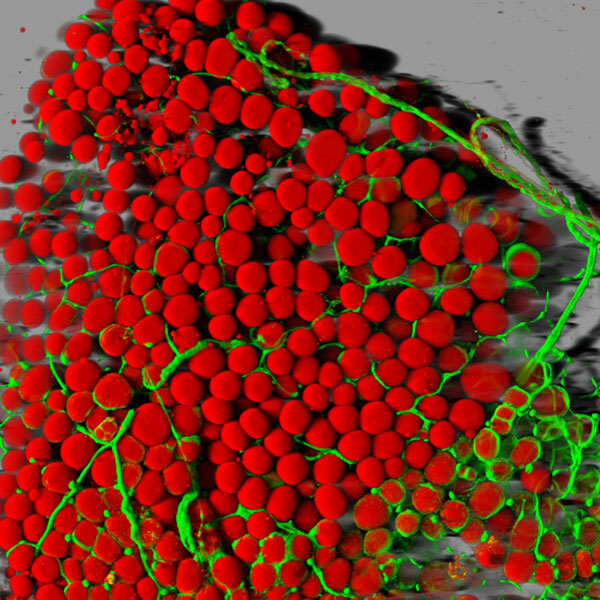 Caption: Fat cells (red) surrounded by blood vessels (green) that supply them with nutrients. With all of today’s sophisticated microscopes, you’d think it would be simple to take high-magnification photos of fat—but it’s not. Fat tissue often leaks slippery contents, namely lipids, when it’s thinly sliced for viewing under a microscope. And even when a sample is prepared without leakage, there’s another hurdle: the viscous droplets of lipid contained in the fat cells block light from passing through. So, it’s good news that one of NIH’s intramural scientists here in Bethesda, MD, has come up with a way to produce high-resolution, 3-D images of fat cells like the one you see above. Not only are these images aesthetically appealing, but they’ll be valuable to efforts to expand our understanding of this essential and much-maligned tissue. To achieve this feat, Daniela Malide, a staff scientist at our National Heart, Lung, and Blood Institute’s microscopy core, took advantage of a new fluorescent red dye (LipidTox Red) developed to label lipid molecules inside cells. The dye had never been used to stain entire fat cells, but Malide decided to try it on some fat tissue taken from a mouse that had been genetically engineered to make its blood vessels glow green. After exposing the fat tissue to the dye for 30 minutes, Malide examined it with confocal and two-photon microscopy. And she was stunned by the dramatic results. The dye clung to the lipid molecules, transforming each spherical fat cell into a scarlet orb surrounded by a network of fluorescent green blood vessels. To reveal the 3D architecture of the fat tissue in greater detail, Malide then used a computer to piece together approximately 200 images. Malide’s work focused on white fat cells, which are among the largest cells in the body, at about 100 microns in diameter. These cells’ best known function is storage of extra calories. And too much of a good thing can be a problem, as our national epidemic of obesity demonstrates. Not only can too much fat make it difficult to move and fit into clothes, it can raise the risk of a wide array of health problems. For example, having too much white fat, especially around the belly, can increase the odds of developing heart disease, diabetes, and certain types of cancer. Malide’s imaging is currently featured in the Life: Magnified exhibit at Dulles Airport, co-sponsored by NIH. Her work was also recognized as an “image of distinction” at the 2013 Nikon Small World Photomicrography Competition. Malide is delighted by this recognition, because she thinks art is a wonderful way to communicate science and inspire people. Application of immunocytochemistry and immunofluorescence techniques to adipose tissue and cell cultures. Malide D. Methods Mol Biol. 2008;456:285-97. Confocal Microscopy of Adipocytes. Malide D. Methods Mol Biol. 2001;155:53-64. Ms. Daniela Malide captured the beauteous essence of minuscule cells w/an innovative technology that she manipulated to a great fruition. Now, not only her fellow astute workmates may see the fat cells and enveloping blood vessels w/a concrete clarity, but also the rest of us lay humanity. May we all applaud Ms. Daniela Malide and her fellow scientists for the sacrifices they’ve endured thruout history to better grasp the heretofore secrets of life for the benefit of all mankind. Hello, Mike. I can’t see where it is “for the benefit of all mankind” that Ms. Malide captured the fat cells in this photo. Please explain. TY. Obviously you’ve never heard of a fatty embolus. It’s made of pure fat that exits a broken hip, that lodges itself either in the brain, or in the heart, or the lungs. It would be a good thing to be able to view these fatty emboli in 3d and in color due to the fact that it gives medical staff a tool to visualize whether a specific treatment will or is working. If you have further questions to the validity of this experiment or it’s findings, please enroll in nursing school. Now, bye! Malide really did a great job by trying to experiment with the red fluorescent dye. I think this is a new discovery. She did a nice job bringing the images together to form this awesome 3D picture we have above. I love scientists who are really creative.